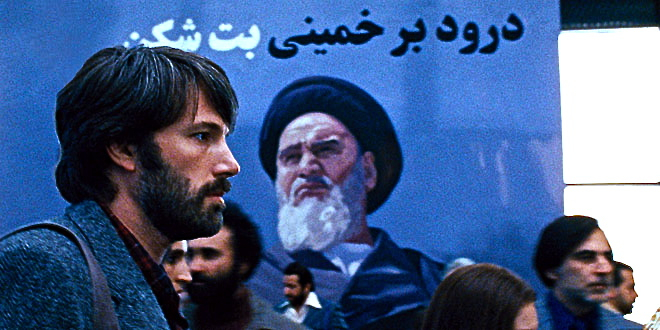 The bad guy in this thriller is a gigantic poster of Ayatollah Khomeini,glaring down at lesser mortals, anywhere you dare to look in post revolution Iran.Just before the 1979 revolution in which the Shah left the country on vacation never to return, Iranians were willing to swear, even on the Koran, that an image of the Ayatollah had appeared on the moon! The incompetent and hedonistic Shah has escaped political retribution and been given political asylum in the US, the same country which installed him in an operation called Ajax.This asylum granting enrages the young revolutionaries and a heavily armed group (among them, it is claimed, the current Iranian president Mahmoud Ahmadinejad) surround the embassy chanting slogans.To them it’s a den of spies.The Americans frantically respond by trying to burn “sensitive material” and when their incinerator fails to handle the load, resort to cheap paper shredders.All but six are taken hostage, who escape to the Canadian ambassadors house, where they are provided refuge.This is the improbable but true set up of Ben Affleck’s thriller. This is also the superb opening sequence of the film and you cant help but think of the storming of the American embassy in Libya and the killing of the US ambassador.Now this Tehran embassy thing was a real intelligence failure, not seeing such a thing coming with 60 staffers as sitting ducks. Argo tells the story of the infamous Iranian hostage crisis from the point of view of Tony Mendez who is a CIA “exfiltration” expert and comes up with an hair-brained scheme to rescue the six in hiding,whose situation is far more precarious than the other fifty-five hostages who will survive as long as the attention of the international community is on them( Muhammad Ali the boxer volunteered to go as hostage in exchange for two hostages).His plan is simple, he will go into Iran posing as a Canadian film company executive and bring back the six as part of his Canadian crew who arrived in Iran separately, and are part of a location scouting trip.His plan, “the best bad plan we have” is accepted by the Jimmy Carter administration and he gets to work.He enlists the help of James Carson (John Goodman) a real life Oscar-winning make up artist for Star Wars and they build the backdrop, taking out ads in Hollywood trade magazines and a holding a fake script reading complete with actors wearing outlandish sci-fi film costumes.Alan Arkin playing the fake film producer is resolute,“If I am going to make a fake movie, it will be a fake hit”! The film is constructed as a thriller with plenty of close shaves and a climax that is rooted more in the film grammar of Argo the fake film within this real film, than in historic reality.The climax in real life was perhaps even more nerve-racking but without the contrivances that this film throws at us.One is required to suspend disbelief at many points but it works on a pure Hitchcockian level of suspense, if you forget for a moment the “based on a true story” spiel. The characters could have been deeper, not Affleck’s Tony Montana, as he is the archetypical CIA spy, albeit nowhere in the neighborhood of Gary Oldman’s John Smiley in Tinker Tailor Soldier Spy, but the rest.There is no attempt to look at the politics on the Iranian side or the American side or the Canadian side for that matter.Given the rich source material this film could have been longer (its a conventional 120 mins verses say 145 mins of the latest Bond film) and more rooted in the fractured reality of that volatile time.Here was an opportunity to trace the genesis of why Iran is still a hot potato in international geopolitics.Instead Iran is just shown as a country full of crazed Islamists except for the Iranian housemaid who apparently has a heart of gold having been humanised by living with the Canadian ambassador. Iranian cinema is a vast repository of real human stories and they are a hit even in Israel, their arch-enemy, and lets not forget Asghar Farhadi’s A Separation which won Oscar just last year.During the film you begin to wonder if this is happening in the same country depicted in the cinema of Makhmalbaf,Kiarostami and Majidi and the task of reconciling the two worlds falls squarely on the audience.Affleck does not shy away from dumbing down his rich content and injecting a big dose of Hollywood formula in the ending. He does well to find the humor in several scenes particularly the set up of creating a fake film production in Hollywood.As the end credits roll with the pictures of the actual events juxtaposed with stills of the film culminating with a voiceover from Jimmy Carter himself, you just cant help but wonder if this is liberal Hollywoods homage to a one term democrat president. Ben Affleck has previously made two very good films, “Gone Baby Gone” and “The Town” and joins a growing list of actors turning directors successfully, bit unlike De Nero,Redford and Sean Penn who make the odd great film sporadically and more like Eastwood.The film is meticulously crafted down to the grainy look which was achieved by halving the number of frames and then blowing up the result to 200%.The locations feel real and the costumes are good to look at, reminding us of our parents old photographs from the 70’s. The timing of the film is serendipitous.Everybody is talking about Iran and a slice of history from the stormy US Iran relationship is always going to elicit interest.And then of course there is Benghazi. Looks like Ben Affleck is the chosen one at the moment and he delivers an eminently watchable blockbuster.